Ken Lacovara, founding dean of Rowan's School of Earth and Environment, was the first faculty member ever invited to deliver a TED Talk. 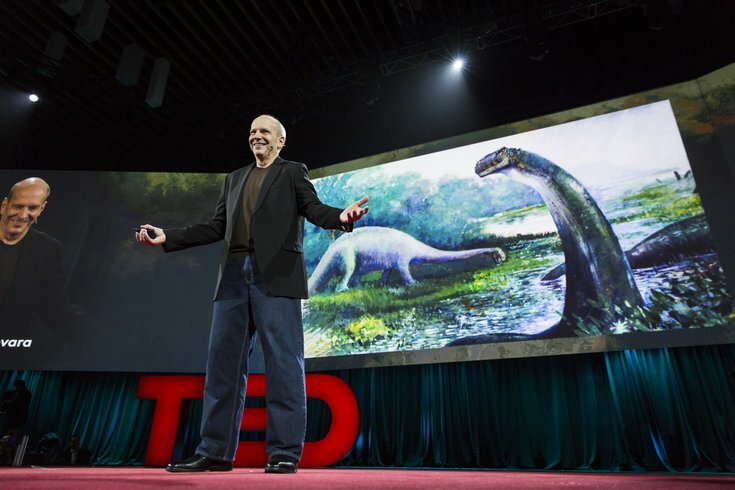 With that fetching opening, Rowan University paleontologist Ken Lacovara enticed his TED Talk audience to dig deeper into their knowledge and understanding of the Earth — its ancient past and its unsettled future -- during his talk earlier this semester in Vancouver. Founding dean of Rowan’s new School of Earth and Environment, Lacovara was the first Rowan faculty member ever invited to deliver a TED Talk. His 16-minute message, which garnered a standing ovation, was delivered to a select, invited audience of the world’s biggest thinkers at the annual TED conference in February. In celebration of Earth Day, the talk is now available to a global audience of millions here. Each year, TED, the non-profit dedicated to “ideas worth spreading,” curates a week of TED talks by some of the world’s most inspired thinkers. Their talks strive to contribute to a deeper understanding of the world through storytelling, focusing on issues from every discipline. Internationally known for his discovery of Dreadnoughtus schrani, a new supermassive dinosaur and the largest and most complete skeleton of a land animal ever found, Lacovara regaled his audience with stories of his discovery in Argentina. But, Lacovara, a gifted communicator who is director of the Rowan University Fossil Park, went further, providing a lightning-fast overview of the history of the Earth’s geological history … and imploring his listeners to act to the global environmental crisis. The study of ancient biomes, Lacovara says, particularly those of the Cretaceous Period (the heyday of the dinosaurs), relates to our emerging understanding of the global response to human-induced climate change. “During the past 250 million years, the world was never hotter, sea level was never higher, and atmospheric carbon dioxide was never more abundant than during the Cretaceous Period,” he says. Additionally, studying the ancient past “gives us perspective and humility,” Lacovara told his TED audience. “The dinosaurs died in the world’s fifth mass extinction, snuffed out in a cosmic accident through no fault of their own. They didn’t see it coming and they didn’t have a choice. Lacovara presented his talk during the “Deep Memory” session of the TED conference Feb. 15-19. He was preceded on the stage by iconic television producer and activist Norman Lear. Other TED presenters included former Vice President and Nobel Laureate Al Gore, who spoke on climate control; musician and composer John Legend; writer and producer Shonda Rhimes; astronaut, engineer, entrepreneur, physician and educator Mae Jemison; Uber problem-solver-in-chief Travis Kalanick; and “Myth Busters” star Adam Savage. In presenting at TED, Lacovara joined the likes of Nobel Prize winners, former presidents, billionaire business executives, rock stars and neuroscientists. Past TED Talk presenters include a veritable who’s who of the world’s most influential people. Among them: Jimmy Carter; Bill Clinton; Bill and Melinda Gates; Michelle Obama; Bono; Jane Goodall, Madeleine Albright; Temple Grandin; Stephen Hawking; Oliver Sacks; Sting; JK Rowling; Billie Jean King; Herbie Hancock; and Gabby Giffords and Mark Kelly. TED presenters attended a five-day conference, where they were among 1,350 people exploring ideas from disciplines as varied as science, business, the arts, and global policy. Since his appearance in Vancouver, Lacovara has been invited to deliver his TED talk at conferences in Mexico and India. On April 28, he will appear on the NPR comedy show “You’re the Expert" in a live broadcast from the Philadelphia Science Festival. This content is sponsored and created by the advertiser. It does not reflect the opinions or views of PhillyVoice.com's editorial staff.